As the daughter of a Tuskegee Airman, striving for perfection was at the epicenter of my existence – a paradigm that paralyzed me, despite my incredible giftedness. Even as a masterful presenter, I spoke with a throttle in my throat – from a place of pleasing others, rather than honoring myself. That shifted when Arthur Joseph – my own personal Yoda – entered my life. Practicing 7 rituals, for 7 minutes, 7 days a week, allowed me to surrender to my truth and step into Stature and my power. Vocal Awareness released me to joyfully claim my Voice…and my greatness. Q: What in your life brought you to the realization that you wanted to improve your voice? A: There I was, sitting in a Marcia Wieder workshop called, “Inspiring Speaker” believing, up until that very day, that I was doing an effective job of communicating meaningful messages that would empower others to transform their lives in powerful ways. I was a multiple Emmy-award winning talk show host for 13 seasons. I had been an on-camera spokesperson and a corporate executive who communicated messages all the time. I thought I was “aware” of my voice, and was using it effectively, UNTIL I met Arthur Samuel Joseph at that workshop. As if it were yesterday, I remember putting my hands to my ears and speaking Arthur’s words: “When I speak, I need to be aware…” And it was in that moment, that I realized that although I speak all the time, I wasn’t fully aware of the power of my Voice, that we all have the capacity to tap into a greater source. When we speak with an expanded energetic/vibrational quality, just by mere osmosis, every one around us expands as a result of it. I was expanded that day when I was in the orbit of an incredible man, who I now refer to as, “my personal Yoda,” Arthur Joseph. It was like being fed inspirational wisdom intravenously. Hearing Arthur for the first time was such a brilliant “Aha.” The idea is so simple, that we trap our fear in our voices, that others can detect it, and that there is actually a way to release it. I knew at that workshop that I had to dive deeper into this work, and discover what was possible for my Self, with a capital “S”. Not only did Arthur open awareness to boundless possibilities for me, he also opened an awareness of how much I had been limiting myself. I must be transparent with you. It was scary at first. It was literally an opportunity for me to take a look at where I had been shortchanging myself, depriving myself, and the world, of the brilliance that I had been gifted with. I was afraid when I first became aware of how, even though I had a persona of being this fabulous on-camera talent who could command attention when I walked into a room, I was in effect a fraud because I was not totally owning all that I was capable of being. In that moment, I realized I had two choices: Either I could keep playing the game the way I had been playing it all my life, and getting away with playing small effectively; Or I could fully own all of my gifts. By choosing option two, I would be claiming my Voice, and as a result would allow myself, and the world to experience what it would mean for me to fully unleash my power. When I began to surrender, and do the actual 7 Rituals that Vocal Awareness so brilliantly teaches us to do, 7 Rituals for 7 Minutes, 7 Days-a-Week, it was like a plant that had been in a drought that was finally being hydrated. As I nurtured and hydrated that plant, it started to stand up in Stature. It started to blossom. As I allowed each conscious, loving breath, and as I began to see the nasal edge and arc of sound, I would speak to people and it would land on their hearts differently. I learned to take my time, and to listen deeply—not only to myself, but also to my Source, and to everyone who I was blessed to have cross my path. My whole world began to shift. As I aligned, I became congruent with my purpose, my passion, and this Work; congruently, I became very intentional about how to allow myself to be the vessel that I was designed to be. I learned to get out of my own way. The universe began to attract, not only attract, but deliver, everything that I needed to claim my own greatness. It all started with 7 Rituals, for 7 minutes a day, 7 days-a-week. Q. Do you recall a moment when you felt a shift or even a breakthrough because of your work with Arthur and/or Vocal Awareness? A: Last July, I took on the challenge of stepping onto an international platform created by eWomen Network called, “The North America’s Next Greatest Speaker” contest. I went there having studied with Arthur, having really worked on the Vocal Awareness techniques, mastering a message that I was going to deliver. Even with all the work that I had been doing, there was still an element of “performing” that was part of who I was. It was scary, and in that moment I called Arthur from back stage to share with him what I was contemplating doing. Arthur listened intently, deeply, as he does, and I felt his presence through the phone when he said, “Yes, Anne, just trust.” So, I stepped on that stage, I tore up my speech, and I spoke from my heart. In that moment, I totally surrendered to Source to guide me. I fully claimed my Voice for the first time ever, and it was a point of liberation, freedom, and joy, absolute joy. From that day forth, I could live my life fully embodying all that I was put here to be. When I left Dallas and went home, I embraced a project that I had started as a result of two major losses in my life, the loss of my brother, Gus Jr., on Dec. 19, 2008, followed one month later by the loss of my father, a Tuskegee airman on January 19, 2009, Inauguration Day. I realized after the passing of my brother and father, then two months later, the passing of my uncle, Walter Lester Henry, a former Buffalo soldier, that this project that I was being called to complete, was a body of work that would liberate gifted adults who were holding themselves back, or hiding behind perfect facades. It would challenge and invite them to embrace their gifts, and claim their greatness. This would guide them to leave an indelible footprint in their lifetime by claiming their Voice, owning all of who they are and leaving a lasting legacy. That offering has evolved and is now in the form of my book, The Gifted Trap…E.M.E.R.G.E. From Gifted to Great (www.TheGiftedTrap.com/book). I am both deeply grateful and humbled that Arthur has so graciously and generously provided the Foreword for the book. So, through his Work, he gave me license and the tools to give birth to my work. I am forever indebted to Arthur, my personal Yoda, the creator of Vocal Awareness. Q. What has been the biggest benefit thus far from your practice of Vocal Awareness? A: The biggest benefit? There are actually two benefits that come to mind. Sharing my Success Story here with you is one example of it – by embracing this Vocal Awareness Work, I was brought into a community of incredible spirits, many beautiful bright lights. The second biggest benefit is that it has given me the tools and the ability to truly speak from my heart in a way that what I say lands on the hearts of others and leaves an indelible mark that empowers others to want to model and embody, as I have learned to do for myself, their own self-defined persona that is in alignment with their divine gifts. I want to invite everyone who is drawn to the Vocal Awareness experience in any way, shape, or form to embrace the invitation to create your own success story. 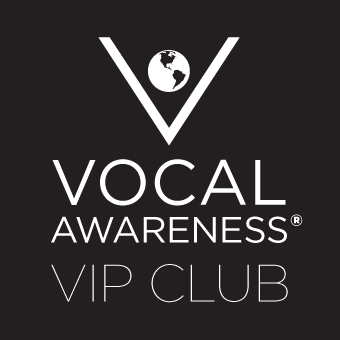 Educate you on the life-transforming foundational principles of Vocal Awareness. Offer you ongoing access to Arthur. Give you insight into both the mechanics and subtleties taught in private lessons.